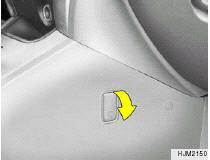 o Pull and raise the "DOOR" release lever to open the tail gate. o To close, lower the door, then press down on it until it locks. To be sure the door is securely fastened, try to pull it up again. 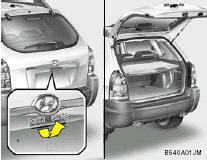 WARNING: The tail gate should always be kept completely closed while the vehicle is in motion. If it is left open or ajar, poisonous exhaust gases may enter the car resulting in serious illness or death to the occupants. See additional warnings concerning exhaust gases. o Pull the "GLASS" release lever (1) to open the tailgate window glass, and raise the window open lever (2). 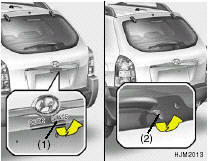 o To close the tail gate window, lower the tail gate window, and it will close by itself. To be sure the tail gate window is securely fastened, try to pull it up again. NOTE: The tail gate window lock is operated in connection with the tail gate lock. 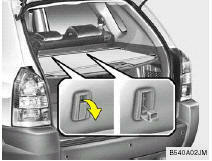 To open the tail gate window make sure the tailgate is unlocked with a key or the central door locking switch. Shopping bag holders are located in the front console and on the backside of the rear seat. When not in use, return it to the original position. CAUTION: o Do not hang a bag beyond 6 Ibs (3 kg). It may cause damage to the shopping bag holder. o Return it to the original position after using the shopping bag holder.